My friend Rachna follows her heart and shares her experience in this GUEST POST. Failing many interviews even after reaching the final rounds, last to get placed even after getting good GPA in my MBA, first to opt out of the placed company due to some unmet promises, sitting idle for 4 months when all my friends were tasting the initial success of their jobs, finally starting on a meager salary that didn’t match with any of my friends’ fancy paychecks… this is how I began my professional life. Puzzled, unsettled and unsatisfied – these were the words that I could then associate myself with. Graduating almost all classes with 1st rank, here I was with no rank or accomplishments at all. I was feeling that it was the biggest failure of my life. Not just because I failed myself but also because I failed to meet my family’s expectations, who dreamt of seeing me in a MNC with all the luxuries of a corporate life. Though I wasn’t satisfied with my salary at the Jaipur based company I joined in September 2010, I enjoyed working for a considerable time period as my responsibilities increased and I felt that I was making a difference. Growth was attractive and it seemed like this was the only good thing that could have happened. But soon the charm died out and stagnation peeped in. Things became monotonous and I could sense a feeling of being tied down to a 10-to-10 job. I didn’t know how to overcome it and give myself the much-needed motivation. The company had given me a lot but that didn’t satiate my aspirations. I expressed my desire to leave but the company asked me to take a sabbatical instead. Deep in my heart, I had already decided to leave but things were not easy as I wasn’t sure what to do next. All I knew was that I couldn’t do a job and I care to live on my own terms – where I am the anchor and boss of my life. With much confusion and family pressure, I rejoined. Things were fine for a few months. However this didn’t last for long. I felt that I dragged myself for the daily schedule that any job demands for. Talking to family members was not an option as their suggestions revolved around sticking to the job and planning things differently post-marriage. Well, I just couldn’t and on the evening of August 25, 2013, took the big decision without telling anyone. I slept over the thought and the next day, emailed my resignation. This time I knew that a sabbatical wasn’t an option. Serving 2 months of notice period was tough but I spent every day in the hope of getting closer to my unsaid dreams. I still remember the 5$ I got from my first freelance work – my first little success. I learnt new things and put in a lot of hard work with the result that slowly, projects started pouring in. (The same client collaborated on projects worth more than 600$.) It was a feeling of accomplishment and satisfaction. Moreover this was the time for a pat from people around me who were shocked by my earlier decision of leaving a settled job. It doesn’t matter how much settled your job is, if your heart is unsettled with what you are doing, then it’s time to take the plunge. It’s almost a year now since I began my new journey and I am happy working as a freelancer who has an option of choosing the projects, clients, deadlines and work hours. Not only that, this 1 year gave me ample time to learn new skills and come up with my own venture – CrispTalks. 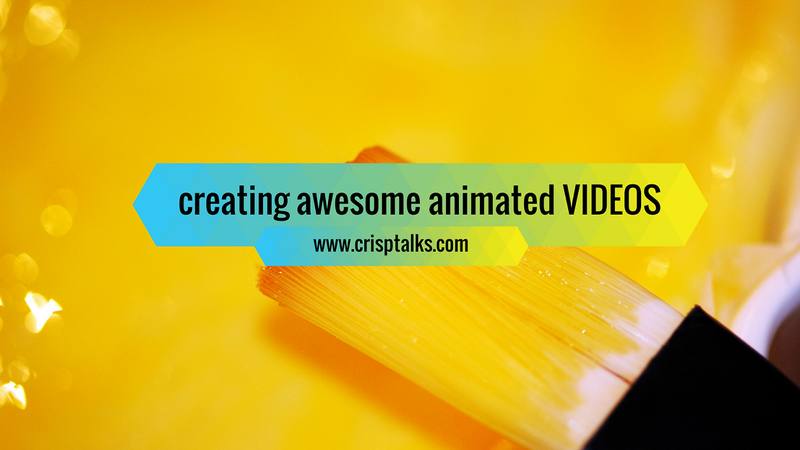 CrispTalks aims at providing affordable awesome animated videos and engaging presentations for start-ups, entrepreneurs and trainers. I also got a chance to review a book written on Powtoon software which will be released in January 2015. Before signing off, I just want to add – do things for your own satisfaction, the rest will automatically fall in place!! Self belief is the word that changes the game for many of us. Read the Feb 2016 follow-up post here. Thanks Deepak. Agree with you, Rachna’s post is inspiring. Nice one, Rachna. Encouraging lines to whom are struggling to find their career path. Seems I am aware of the most of the part of the story, I am happy you followed your heart and that’s the way rest should do, hoping to share my story pretty soon. I would love to hear your story soon. Good.. I’m proud of u. Look u can write so well… I know u won’t thank me.. But its fine.. Pleasure was all mine.. Teaching u..
Time to rise & shine ! !